Calling all runners and race volunteers!! 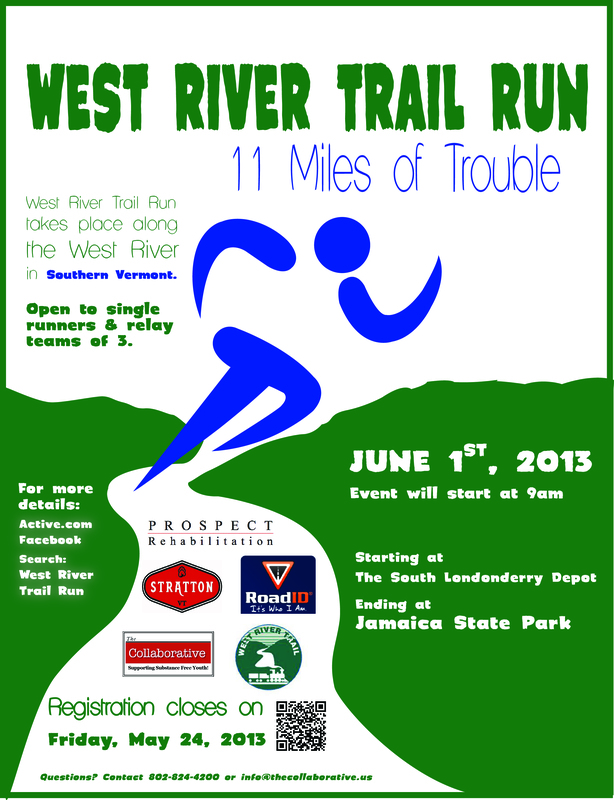 Please join us for the annual West River Trail Run on Saturday, June 1st! Please contact us for more information about the event or if you are interested in helping out! Hurry! Registration is limited and closes this Friday, May 24, 2013. Email us at info@thecollaborative.us or call us at 802.824.4200. See poster for more details and contact information. The Collaborative will be hosting its first Trail Run on June 1st, 2013. This is an annual event to help the Collaborative to provide fun, healthy educational programs for youth in the Northshire and Mountain communities. Please check THE COLLABORATIVE WEBSITE for more information and to register. Relay teams of 3 or individuals are invited to participate. Runners have the option to ride the bus from Jamaica State Park back to the start after the awards ceremony. Relay teams are allowed one car during the run to transport. Teams are responsible for their own transportation. Runner 1: 4 miles of flat trail. Runner is on the main rail-trail, which provides a more gentle grade and relatively easy travel. Trail follows the campground road through the campground and over a single-lane bridge crossing the Winhall River. Runner 2: 4 miles of uphill and switchback, single trail. From the south trailhead of Winhall Campground, the surpack surface of the West River Trail continues along the river’s edge. Becoming a footpath through the forest, the single-track section of trail involves several short uphill jaunts and a variety of stream crossings. This is considered the most challenging section of the trail. Runner 3: 3.5 miles of gradual downhill and flat trail. The switchback trail traverses back and forth across the steep face of the dam, arriving in the river valley as a footpath. The trail follows the river down stream, crossing the Cobb Bridge. The West River Trail continues along the old railroad grade. This section of trail is well-used and provides easy running with lovely views of the river. To register, click HERE. Registration closes on Friday, May 24, 2013. Registrations may be mailed to The Collaborative c/o Trail Run, PO Box 32, South Londonderry, VT 05155. Email us at info@thecollaborative.us or call us at 802.824.4200. The Run will start at 9 am on June 1st. Thank you to our sponsors and partners: Friends of the West River Trail, Jamaica State Park, Ball Mountain/Townsend Lakes. For more information and to register, check EVENT WEBSITE. This entry was posted in running, upper section, vermont, west river trail and tagged nature, outdoors, upper section, west river trail, west river trail run. Bookmark the permalink.